I deleted/deactivated the last admin, how can I fix it? How can I enable debug logging? ClusterIP is a virtual IP, which will not respond to ping. Best way to test if the ClusterIP is configured correctly, is by using curl to access the IP and port to see if it responds. Where can I manage Node Templates? Node Templates can be accessed by opening your account menu (top right) and selecting Node Templates. Why is my Layer-4 Load Balancer in Pending state? Where is the state of Rancher stored? Single node install: in the embedded etcd of the rancher/rancher container, located at /var/lib/rancher. High Availability install: in the etcd of the RKE cluster created to run Rancher. How are the supported Docker versions determined? We follow the validated Docker versions for upstream Kubernetes releases. The validated versions can be found under External Dependencies in the Kubernetes release CHANGELOG.md. How can I access nodes created by Rancher? SSH keys to access the nodes created by Rancher can be downloaded via the Nodes view. 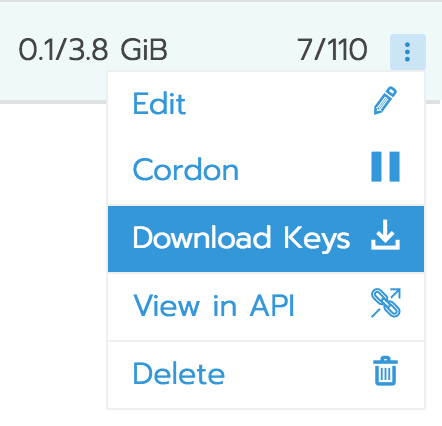 Choose the node which you want to access and click on the vertical ellipsis button at the end of the row, and choose Download Keys as shown in the picture below. How can I automate task X in Rancher? Visit https://your_rancher_ip/v3 and browse the API options. The IP address of a node changed, how can I recover? A node is required to have a static IP configured (or a reserved IP via DHCP). If the IP of a node has changed, you will have to remove it from the cluster and readd it. After it is removed, Rancher will update the cluster to the correct state. If the cluster is no longer in Provisioning state, the node is removed from the cluster. When the IP address of the node changed, Rancher lost connection to the node, so it will be unable to clean the node properly. See Cleaning cluster nodes to clean the node. When the node is removed from the cluster, and the node is cleaned, you can readd the node to the cluster. How can I add additional arguments/binds/environment variables to Kubernetes components in a Rancher Launched Kubernetes cluster? You can add additional arguments/binds/environment variables via the Config File option in Cluster Options. For more information, see the Extra Args, Extra Binds, and Extra Environment Variables in the RKE documentation or browse the Example Cluster.ymls. How do I check if my certificate chain is valid? Note: Configure SSL_CERT_DIR and SSL_CERT_FILE to a dummy location to make sure the OS installed certificates are not used when verifying manually. If you have successfully verified your certificate chain, you should include needed intermediate CA certificates in the server certificate to complete the certificate chain for any connection made to Rancher (for example, by the Rancher agent). The order of the certificates in the server certificate file should be first the server certificate itself (contents of rancher.yourdomain.com.pem), followed by intermediate CA certificate(s) (contents of intermediate.pem). How do I check Common Name and Subject Alternative Names in my server certificate? Although technically an entry in Subject Alternative Names is required, having the hostname in both Common Name and as entry in Subject Alternative Names gives you maximum compatibility with older browser/applications. Why does it take 5+ minutes for a pod to be rescheduled when a node has failed? See Kubernetes: kubelet and Kubernetes: kube-controller-manager for more information on these settings. In Kubernetes v1.13, the TaintBasedEvictions feature is enabled by default. See Kubernetes: Taint based Evictions for more information. default-not-ready-toleration-seconds: Indicates the tolerationSeconds of the toleration for notReady:NoExecute that is added by default to every pod that does not already have such a toleration. default-unreachable-toleration-seconds: Indicates the tolerationSeconds of the toleration for unreachable:NoExecute that is added by default to every pod that does not already have such a toleration. Can I use keyboard shortcuts in the UI? Yes, most parts of the UI can be reached using keyboard shortcuts. For an overview of the available shortcuts, press ? anywhere in the UI.